Could Aftercare Grades Be Followed by Integrity Ratings? The Horseplayers Association of North America (HANA) confirmed to TDN last week that “aftercare grades” for individual racetracks will soon be a new component of the influential Track Rating System that the non-profit bettors’ advocacy group publishes annually. The move is a recognition that horseplayers are increasingly factoring Thoroughbred welfare into their decisions about whether or not to wager upon certain tracks or circuits. But even though Jeff Platt, the president of HANA, is emphatic in his belief that the Track Rating System needs to use its clout to divert betting money away from the worst welfare offenders by letting horseplayers know which tracks rate “A” or “F” in terms of aftercare efforts, he openly admits he is still struggling with the best way to quantify such a subjective and complex issue. In fact, Platt said he’s been so fixated on researching existing aftercare programs and getting the new ratings right that his summer-long tinkering with a “secret sauce” algorithm to quantify his findings is what has caused HANA to be five months late in releasing its entire slate of ratings for this year. Since 2009, the Tack Rating System has ranked how bettor-friendly tracks are based on analytical data points such as takeout rates, field sizes and handle trends (in all, there are more than two dozen sortable categories; you can view the 2017 list here). Bettors, in growing numbers, are seeking out the HANA ratings to get an idea of how much bang they’re getting for their wagering bucks. In addition, HANA has taken credit for initiating several successful pari-mutuel boycotts in recent years, mostly over high takeout complaints. Perhaps as a result, racetrack executives are increasingly aware of (and sensitive to) where their products stand in the HANA ratings. But if HANA is now going to attempt to navigate the slippery slope of quantifying blame or credit for aftercare, can other gray-area subjects of horseplayer relevance be far behind? I asked Platt if HANA is considering taking on other “integrity issues” like the effectiveness and scope of a state’s drug testing, or the competency and transparency of track stewards and commission-level regulators. And if so, how would HANA go about quantifying them? Crowdsourcing is a digital-age term for polling a large cross-section of the online public to get a more accurate snapshot of a complex environment while (theoretically) empowering and giving a greater voice to individual participants. Platt said the idea of HANA using something like an internet survey to generate meaningful data is a possible future option. The technology exists, he added, to conduct accurate online surveys that make it difficult (but not impossible) for respondents to stuff the electronic ballot box. Another independent group aiming to promote positive changes in the racing industry, the Thoroughbred Idea Foundation (TIF), debuted its first significant study last week since forming earlier in the year and officially opening an advocacy office in Lexington Aug. 1. The Sept. 7 release of a white paper titled Penny Breakage–Returning Rightful Winnings to Horseplayers calls for the modernization of rounding pari-mutuel winnings to the closest cent instead of the long-entrenched North American practice of rounding down payouts to the nearest dime. As explained in a Friday story by TDN‘s Bill Finley, The TIF estimates that this outdated form of breakage calculation costs horseplayers some $50 million on an annual basis, and the paper makes a cogent argument for returning this money to bettors instead of allowing bet-takers to hold on to the excess rounding. While the white paper on breakage is thorough and well-researched, the real challenge for the TIF will be motivating racetracks and racing commissions to jettison the current format in favor of the more bettor-friendly method. 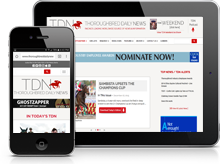 As founding TIF board member Craig Bernick pointed out in a TDN Q&A interview back in May, there is no shortage of good ideas in racing–getting them implemented is the chief problem. Thus, payoffs ending in an amount of 49 cents or lower would get rounded down to the lowest whole dollar amount, while payoffs ending in 50 cents or greater get rounded up to the highest whole dollar amount. “This breakage accounting method is applied in Hong Kong without controversy,” the TIF reported. A GoFundMe page has been established for Idaho-based jockey Nikeela Black, who is currently paralyzed from the waist down after a spill at the mixed-meet Eastern Idaho State Fair (aka Blackfoot) on Sept. 2. Lee Abrams, Black’s husband, told KTVB in Boise that doctors don’t yet know if the paralysis will be permanent. “It sounds like she clipped heels with the horse on the outside of her. She was on the rail, and her horse went down, and we think that she maybe got run over by the horses behind her,” Abrams told KTVB, adding that he believes no video of the accident exists. Black, who also works as an attorney, was named by The Idaho Business Review as one of the state’s “50 Outstanding Women of the Year” in 2015, when she also made the publication’s “Accomplished Under 40” list. Riding selectively on small-track and fair circuits in the West, Black is known for annually racking up high winning percentages despite limited opportunities. She has an 11-2-5 record (48% win) from 23 mounts in 2018. In her latest GoFundMe update on Saturday, Black, who is currently hospitalized in Utah, wrote that she is scheduled for a Monday assessment to see if she can transfer into the renowned neurological rehabilitation program at Craig Hospital in Colorado.